A new design for the John Deere X300 Select Series range of lawn tractors has been introduced to coincide with this year’s launch of the new X310 model. The bonnets across the range now match the John Deere family style of the company’s agricultural tractors and present the same fresh and modern appearance. Suitable for areas of grass up to 8000m2, the lawn tractors in this range are extremely straightforward to operate. Performance and reliability are guaranteed with a powerful, fuel-efficient engine and easily adjustable cutting height, which can be changed without having to leave your seat. 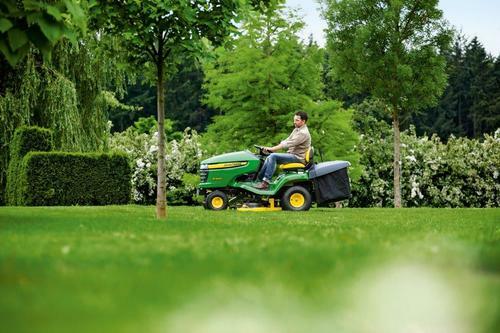 Excellent manoeuvrability in the tightest spaces ensures a perfect cut, even in the most intricately landscaped gardens. Standard features include automatic transmission, Twin Touch foot pedals, cruise control and an ultra-comfortable seat. The five lawn tractors that make up the X300 Series offer a choice of mower decks with cutting widths from 97cm (38in) on the X300 model to 122cm (48in) on the X320, plus options to collect, side discharge or mulch grass clippings. For year round versatility, these lawn tractors can be fitted with a front-mounted brush, snow blade or snow blower. UK list prices for the X300 Series start at £2825 plus VAT; the starting price for this year’s new model, the X310, is £3600 plus VAT.